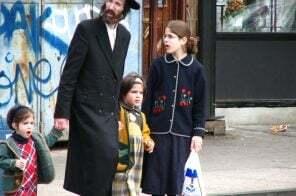 While New Yorkers have been celebrating the historic seaside resort all summer long, this weekend the Coney Island History Project is hosting its seventh annual history day. On Saturday, August 5, from 12 p.m. to 5 p.m., attendees can learn about all of the classic rides and attractions of Deno’s Wonder Wheel Park, take a self-guided tour, and listen to free folksy music. Since it was built in 1920, more than 40 million people have experienced the park’s iconic Wonder Wheel. 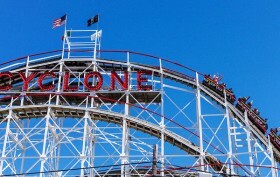 On June 26, 1927 the Coney Island Cyclone opened in Brooklyn. The iconic wooden coaster, located on the corner of Surf Avenue and West 10th Street, is one of the oldest functional amusement rides in the United States. While it only cost $.25 to ride when it first opened, today it costs about $10. Found at Luna Park, the coaster takes you over 2,640 feet of track at 60 miles per hour, with 12 drops (the highest an 85-foot, 60-degree plunge) and 27 elevation changes in roughly two minutes. On this day in 1884, the country’s first roller coaster opened at Coney Island, sparking Americans’ obsession with amusement rides. Invented by LaMarcus Thompson, the ride, called the Switchback Railway, spanned 600 feet and traveled just six miles per hour. Unlike today’s coasters, the Switchback did not make a round trip loop, and passengers exited at the end of the track. The one-minute long ride cost only five cents. 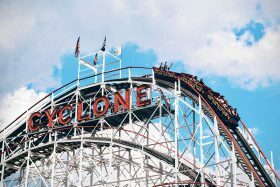 Ride the Coney Island Cyclone for Free This Weekend! 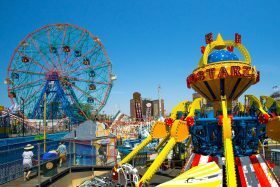 If visiting Coney Island has long been on your list of NYC to-dos, this weekend might be the best weekend to head down to the famed beach and boardwalk. 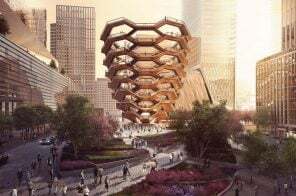 On top of what will be gorgeous weather, per the Coney Island Blog, the amusement park’s iconic wooden roller coaster will be offering FREE rides to 89 thrill-seekers. The roller coaster, which normally costs $10 a go, will kick off its promo Sunday at noon in celebration of its 89th birthday (it opened June 26, 1927). So hold onto your hats—and your lunches—and be sure to take some time to absorb the history of this inimitable destination.